Student Question: You have clarified the function of knees and kua and their primary role in directing action of the waist, dantian and upper body. Can you elaborate further on the mechanics of how the kua directs the activity of the dantian, to allow the qualities of correct practice and higher levels of Tai Chi? Chen Zhonghua: Consider the globe of the earth. We have all seen these globes, resting in a seat cradle underneath. Similarly, the kua has legs underneath it. Compare what is above it to the globe. This “globe” for us is the dantian. Dantian is anything sitting on top of the two kua. When two kua move proportionately, in coordination with each other, the dantian resting above can function correctly for desired results. If one kua moves more than the other kua, you will see a “noodling” quality or other incorrect practice. This defines the relationship between kua and dantian. Kua is only the seat. Dantian is what is on top of the seat. If one kua disengages from this dantian, resulting movement is not upright, not balanced, causing “noodling,” “wiggling,” and other incorrect qualities. An example would be belly dance movement, as contrasting with the dantian movement we describe. Student Question: Practically speaking, when I see you move, your shoulders stay level and your hips stay level. They rotate, but they don’t gyrate up and down. Chen Zhonghua: They don’t but they do. You may not see the subtle underlying activity. Student Question: Well, I see the back of the hips where they are connected is moving a lot, but it keeps the part above those ball joints appearing to stay level. It seems to me that the pelvic hip joints, which are level with the dantian and the waist, they seem to stay level. Chen Zhonghua: Sure, that seems a good observation and you can say that, I agree with you. Student Question: I think when most people say “hips,” they don’t understand anatomy. They may understand hips as being all those bones in the waist area. Where the hip joints are really much lower than that at the top, right where the leg sockets are. Those leg sockets twist around all over, but you can rotate them by adjusting them in coordination and still keep the hip joints level. Chen Zhonghua: Yes. You are describing what you see, as correct or incorrect. Also you are describing a quality. A good quality, high quality and low quality. But the essence is still deeper than that. Essentially, it is like the ball “sitting in the seat.” You can move the globe with the seat stable. Or move the seat, the globe will move. The bottom line will depend on skill level. At varying levels of skill, your actions are different. At higher levels, the seat remains stationary, always adjusting. The globe moves above it. At beginning level, we are incapable of movement of the globe by not moving, so we move a lot. The result is overextension and problems we have notices. You observe my hips and kua area remain relatively stable, yet I can still cause action of the body. That’s the difference between our levels. Ultimately, at the highest the level, it should’t even move. Let me describe it another way. Consider the U joint on a car. It can move the wheel of the car in various directions. Whatever the range of direction, it is still movement. Yet a look underneath the car would reveal the U joint as fixed onto the bottom frame of the car. Like that, the body part, the joint of the kua, is fixed. Yet what’s inside it can move any direction. Another analogy. Make your one hand like a cup, your other hand a fist. Put your fist in the cup. The cup is like the kua.The fist is inside it. Now rotate your fist, in the kua. The cup never moves, yet it allows the fist to change in various directions. In this manner, the kua doesn’t really move. Yet it causes, it adjusts other parts of your body to move within a fixed frame. Student Question: Is that contradictory to what you said earlier, about incorrect movement of waist first, to move the kua and knees–that correct action is driven from knees, with kua adjusting, then causing waist to move? Chen Zhonghua: No, not contradictory. It’s exactly the same. For example, imagine your fist inside the cup. Your fist is like the femur that goes into the kua. It moves because the knee moves. The kua is in a fixed position, but it adjusts to allow movement changing direction. The kua is open, adjusting smoothly, so your body can change direction within a fixed frame. This is the requirement of Tai Chi, which appears contradictory to students. It is that very elusive ability which must be developed over time through practice. Student Question: Could you explain the contradiction? Chen Zhonghua: The contradiction of Tai Chi is that your body does not appear to move and yet you have to create action internally, to generate a degree of power and dynamism at least equal to external arts such as boxing. How can you generate such power, if your body as a whole does not appear to move at all? The kua hold the key to answer this dilemma. When the kua is activated correctly, the kua and other body parts provide a fixed frame, so your body appears not to move. Yet this allows activity inside to produce external results. Student Question: That leads to the question of the concept of energy transfer–getting power or energy from the ground, the legs, to the torso, waist, arms, hands. The key to real power sounds like this coordinating control of the kua? Can you describe the process or explain the role of the kua in this transfer of energy from the ground, the legs, the kua, the torso, the waist, arms, hands–the role of the kua in generating that power? Chen Zhonghua: Let’s view this from a different perspective. Internal energy is activated through movement of joints, not through lack of movement. Rather, there is a flow of movement within the frame. But the action of the joints is not that they are “stretched,” or “extended,” or move horizontally. The joints are only turned, or rotated. Student Question: What you are describing sounds like experience of the kua in doing a positive circle. I feel the pelvic girdle stays centered and that’s the only way my dantian can stay centered. What happens is that the two kua kind of push against each other. So they have to turn. One has to rotate up to the other one around in the opposite direction of the circle. It’s like they are pumping into each other. You are getting onto something very important here. The key is, your two kua are locked onto your body frame. Fixed in place, they do not move from that frame, they only rotate. This is very different from your two hands, for example, which can move freely, without connection with rest of body. The kua is not free to move horizontally. Unlike hands, you can’t put one kua on your body and the other three feet away from your body. Your two kua are always connected, as an anatomical constant fact. When you believe you are moving your kua, you are actually just rotating one kua against the other. As you just said, it’s as if they squeeze together toward each other causing your waist to turn. That’s very crucial. In terms of function of the kua in generation of energy, the kua is essentially a junction. So anything that you talk about in regards to any joint applies to kua. 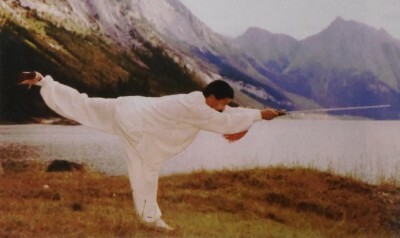 Tai Chi energy being the product of joint rotation, the kua’s role is most important, since it is the largest joint. Rotation of a small joint generates a small range of movement. When you rotate large joint, you generate a large range of movement. When you rotate your two kua, they cause your waist, your dantian, to turn. It is a coordinated and proportional movement, not independent activity of the kua. As the largest joint, the kua’s effect on range of movement of the dantian and waist can be quite significant, so much so that the entire body can appear to move. 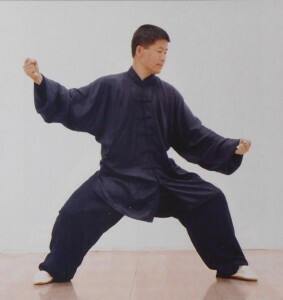 This is the unique quality of Tai Chi movement, generated by joint rotation, not by muscles pushing and pulling. This is drastically different from normal human activity, which employs the muscles independently pushing and pulling various parts of the body. Student Question: It seems the reason the kua makes everything else move, is because it’s in the middle of the body. Or it is controlling the waist, which is in the middle of the body. Chen Zhonghua: Yes, you can say that. As well as being the largest joint, the kua is most strategically positioned. These things illustrate its crucial importance. Student Question: As I understand your description of generation of power in the upper body, it’s the rotation of the kua, being in the middle, with the knees pumping the ground, driving the power directly through the center to get to those points of the upper body. What about in terms of its role in the classical Tai Chi functions? For example, to absorb and neutralize, when an opponent is pushing on you. You can maintain your balance or adjust your body parts to absorb his power and neutralize it and then redirect it. Chen Zhonghua: Yes. Using kua to make dantian waist rotation, half a waist turn translates into 30-50 centimeters, or more, between one and two and a half feet. That is a wide range of movement, in terms of neutralization. Student Question: How about in terms of redirecting power and then releasing power? Chen Zhonghua: Your question reflects misunderstanding, as you are using the term incorrectly. There is no redirection and no release. The most crucial thing is to have proper use of dantian, that long ball centered in the body, controlled by its seat, the kua. For example, in practice, my body is round. My physical action is more rounded than your physical action. Everything relates to the dantian. My movements more clearly reflect rotation around a clearly identified center. You might feel that you are trying to move like a ball too, but it appears as more linear movement. This prevents accomplishment of the higher Tai Chi skills. All these skills people mention are representations of this one action. The big ball in the center moving and turning. To simply say this move is redirect, this move is push, this move is absorbing–such descriptions are incorrect. 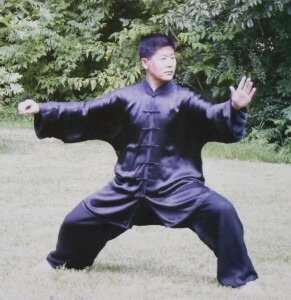 I can tell you though, when you master rotation of the center of your body, you will have peng, lu, ji, an and all the other Tai Chi energies. How they relate is an extensive topic for future discussion. Student Question: So the correct description is that you just have this very centered awareness that automatically adjusts to any movement upon it, or any pressure upon it? Through training, eventually you experience the body as always pivoting on one “dot.” Everything rotates and moves around it. That’s Hong’s description of the overall guiding principle. Feng’s overall guiding principle is “one grain of qi.” They are talking about the same thing. Student Question: Is it a state of awareness and coordination of body, that the individual is experiencing all movement pivoting on this one point right in the center of the body? Chen Zhonghua: Yes. And because everything pivots on it, you know where your center is and your opponent can’t find the center. The requirement of Tai Chi is to be centered and not reveal to your opponent where that center is. Your opponent feels no center, because he can’t find it. Wherever he pushes, he can never catch what he cannot find. But if you lack recognition of your own center, your opponent can find it all the time. When you push, you generate a center as you respond to the push–your center goes directly into the push. Student Question: When you haven’t developed the awareness and coordination of that center, it’s easy for the opponent to find it because any time you try to move or push you’re pushing it right into him? Chen Zhonghua: Yes. Also, from another angle, if I consciously create a center somewhere on myself, you can never find it. And if I don’t establish a center you can find it, because whenever you touch me you are actually creating a center on me. Student Question: Because the person being pushed knows how to establish balance? So the key is really about equilibrium and balance? Chen Zhonghua: Yes. It’s who owns it. Student Question: The one who owns the central equilibrium? Chen Zhonghua: Yes. That word I have no problem with. In terms of yin and yang, balance and establishing center are critical variables. Student Question: And when you resist, or meet force by force, you lose balance and immediately expose your center to your opponent? Chen Zhonghua: If you own center, I lose it. If I own it, I don’t lose it and you can’t find it. That’s the objective of training. I have a student who is a magician. He says you impose your conduct onto your opponent. Understand that? Student Question: Yes, but it seems pretty abstract. Chen Zhonghua: It means, through training, I can “construct” a center onto myself, so you will not recognize it or be able to locate it. Before you start pushing me, I have already formulated a center in my body. As your actions are consumed in attempting to find my center, you cannot establish a center for yourself. Without any center you are lost. Student Question: You don’t have awareness and balance from that central point? Chen Zhonghua: You can also see that when people do the form incorrectly. From perception of a skilled eye, in observation of someone practicing form, it is obvious when there is no awareness of center. The quality of “waving arms,” arms moving independently from the body, overextension and other flaws will be apparent. This brings us full circle, to recognize the primary importance of the correct use of kua, driven by knees, guiding the waist with awareness of the center of dantian, coordinating activities of the upper body. Student Question: Concerning training to improve these skills, how can we open up the kua? Here is the problem. People have difficulties practicing, because they are always compensating one part of the body for another, to try to get the appearance of the teacher’s form. How would you advise students to practice, to open the kua? Also practicing the “fetching the pail,” “twisting towel” and “6 sealing 4 closing” exercises. Practice that kua exercise, in which you squat down sideways with one leg stretched out, like the action of falling into a sled. Practice each side. But these exercises do not really produce the open kua experience. They only loosen up the kua, so you are ready. The ultimate experience of the kua opening evolves over time as one learns how to “restrain,” or be in control of its movement. I’ll give you analogy, to illustrate how to practice correctly. Compare the kua movement to a ball turning. The restraining capability I am describing is like that turning ball rotating inside a square box. Imagine the sides of the ball, in constant contact with the box’s four sides, is always “restrained” from any horizontal movement. The ball can only rotate in its fixed position, inside the box. If the top of the box is open, you can touch it to spin the ball, but the ball doesn’t “toss” or move horizontally. It only rotates. This analogy illustrates the guideline for form practice. Body movement should be always “connected” and driven by joint rotation, not by independent movement of body parts. Form should be upright and stable. The body shouldn’t bob up and down, not toss from side to side. The spine must be straight, moving rotationally from center, rather than tilting. Arms only move connected with the torso, from kua rotation driven by legs, not independently from the body. That is what kua movement is about. Only by moving in this manner, can you eventually develop your kua. The function of the kua is to be able to rotate constantly, with the body adjusting accordingly. Many people develop only range of motion of the kua, not functional ability. Movement without stable rotation accomplishes nothing. Only balanced, coordinated kua rotation produces the qualities of soft, smooth, stable, neutralizing, redirecting–all Tai Chi qualities. 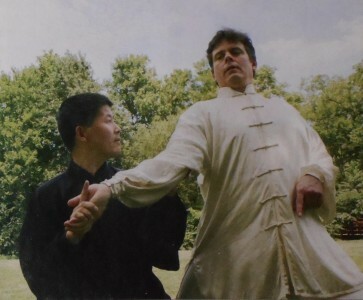 Tai Chi requires adjustment of each kua with each other in complete coordination, with the area above the kua maintaining its equilibrium in the midst of those two rotations. Student Question: That’s what causes the body or the arms or the movements in the form to be caused by that rotation rather than to be caused by muscles pushing and pulling those parts of the body around? Chen Zhonghua: Yes. Another point, as Master Hong said, “The opening of the kua is a matter of one millimeter.” If your kua is open, a very minute movement can bring profound results. Student Question: Could you say it the two kua are open they always counterbalance each other properly to allow the proper alignment and direction of the body? Then the kua can allow the body to have tremendous power because it is structurally aligned? Chen Zhonghua: Yes. If the body is connected, with proper structural alignment, a little bit of direction from the kua gives it tremendous power, because the whole body’s weight can be directed at the point of contact. If the kua is not open, mere physical movement of the kua may be like that of a belly dancer, without value for Tai Chi. Or one might possess the flexibility of a gymnast, moving the kua any which way, but have no Tai Chi skill. Stretching and increasing flexibility are a physical property, not necessarily indicative of an open kua. They do not have a Tai Chi function. 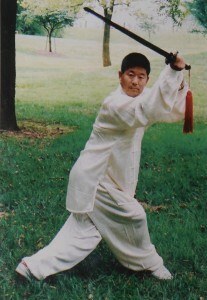 Opening of the kua is a function, vital for correct Tai Chi movement. Opening of the kua is a special quality. It reflects the ability to turn your kua to serve Tai Chi, to facilitate the proper structural alignment for postures to serve their proper function. Coordinating the two kua together to produce the proper structural flow–this creates the proper Tai Chi form, with power, root and whole body movement. The unity of movement of the different parts of the body is dependent upon the kua functioning properly to facilitate structuring of that unity. Tai Chi Magazine article on the Function of Kua with John Brown.